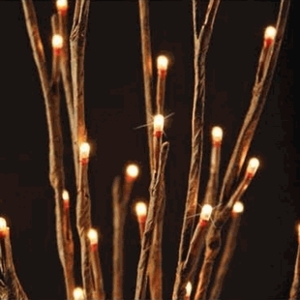 Illuminated branch lights that capture and enhance the beauty of nature. These designer lights can be shaped easily to fit into any vase or simply added to your existing silk or dried floral arrangements. The beauty of these lights will give you years of enjoyment. Approximately 19 Inches tall with 60 light bulbs. Comes with ac adapter, 15 foot cord for easy plug in.